Students - Today's poem came from a drawing and a bit of thinking that came from the drawing. Above, you can see a shell that I drew. I was looking through a jewelers loupe, trying to draw as accurately as I could. 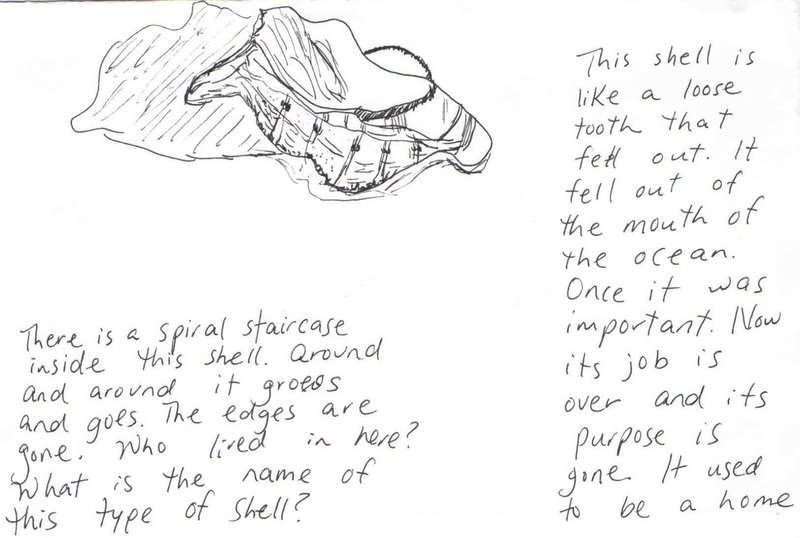 Then, I took a few notes about what the shell made me think about, what it reminded me of. I asked myself the Questions from Kerry Ruef's book, THE PRIVATE EYE: What does it look like? What else does it remind me of? Why is it like that? Why did it remind me of that? A few days later, I came back to my sketch and notes and turned my initial interesting thought into the short verse atop this post. Can you look at the notes and then follow the trail of drawing to writing to poem? ...the intellectual development that comes when kids (and adults) are nudged to press for 5 - 10 things “it reminds them of”. Repetition of the Questions — and a person’s answers — is what builds fluency and a habit for creative and critical work, poetry and beyond. People who are already highly associative and know instinctively how to put their associations to work don’t need the Questions, per se. But most people need those questions made conscious and succinct. The questions work in concert for arousing associations, for exploring overlapping characteristics in associations, and for creating inferences, solving problems, and making theories out of their associations. The Questions themselves act as magnifier, they cause the mind to keep looking as it makes associations/connections of all kinds. The Questioning sequence is actually the most important part of The Private Eye. Today, if you're not sure what to write, try starting with drawing. Look at something very closely. Study it. Draw its lines and edges and curves and leave its white spaces. Then take some Private Eye notes. Ask yourself the Questions: What does it look like? What else does it remind me of? Can I think of 5-10 things it reminds me of? Why is it like that? Why did it remind me of that? 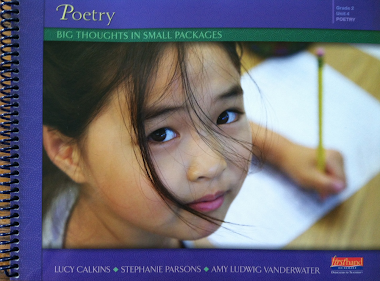 Use these notes to help you begin a poem or a story or a piece of nonfiction. Your drawing will lead you. 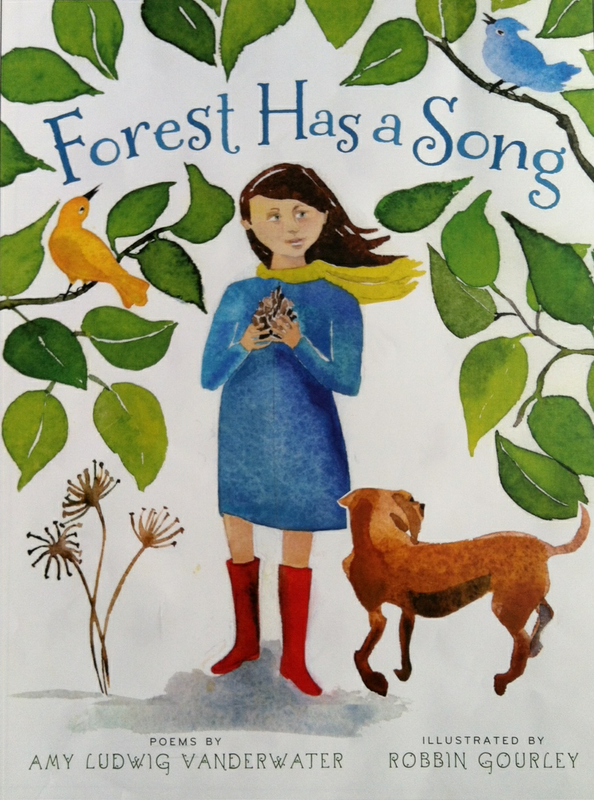 Thank you to Irene Latham, my dear poetry friend who told me all about The Private Eye when she recommended it to me as a way to help children explore the forest with my new book. When you see me soon with FOREST HAS A SONG, I'll likely have a jewelers loupe in my pocket! 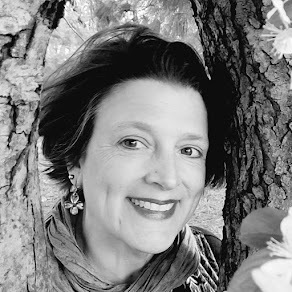 Today's Poetry Friday roundup is brought to us by Heidi Mordhorst over at My Juicy Little Universe. It's wonderful to have her back from her time away, and I encourage you to head on over and check out this week's poetry menu. Love the idea of shells being teeth...and taking part of a smile home! Great job, Amy. This whole post has wonderful nooks and crannies to explore! Books, drawings, things to think about. Thanks, Amy! Love The Private Eye. And you poem with the sketch. Love finding shelss, the ocean's baby teeth. Thanks for sharing. I love the shells as baby teeth! I can't wait to explore The Private Eye. I love poetry AND science. 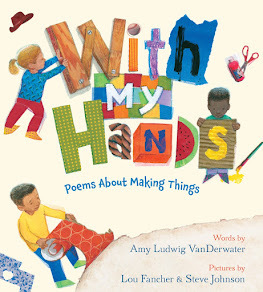 Love the playfulness of your poem, Amy. The image of shells being the ocean's teeth is wonderful. Your posts are always so full of interesting reflection. Talking about looking closely is so important in the process of writing. It's something I need to remind myself sometimes. Maybe I'll give this a try sometime soon. Your poem made me want to go sit on the beach to see what I could discover. I loved the ending because it is so true about shells, we bring them home to remember "a piece of ocean smile." I love this, Amy! It's one of my all time faves. I love the ocean smile! I love this! 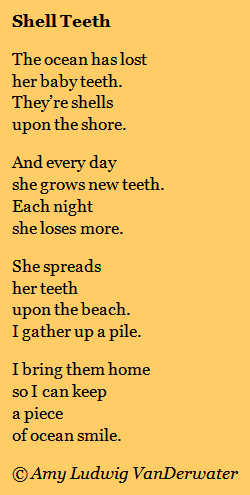 My grandmother gave me my first piece of "ocean smile" when I was 4 or 5, and I've had shells everywhere ever since. Thank you for sharing! Thrillingly rich post as usual--the loupe reminds me of some work I did last month in the Religious Education program at my UU congregation...the result is a booklet called "Telling the Truth in Poetry". It's almost done. I hope to post some of the poems next Friday and you'll see why they connect to Private Eye. Short and sweet poem, Amy. I like the idea that shells are ocean teeth and collecting shells are collecting ocean smiles. Nice job! Amy, I love love love this poem. My girls are both in that losing-a-lot-of-teeth phase, so it resonated with me a lot. d I think so many school-age children would just adore this poem, too. 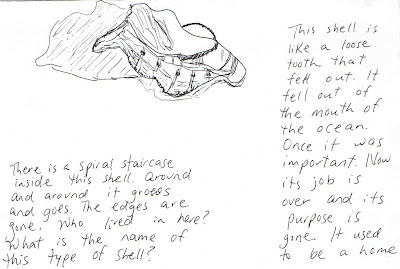 I also loved seeing how you went from your initial thoughts about the shell to your final poem. Thanks for sharing! This is lovely, Amy (and so is the backward-walking man post)! I will have to check out The Private Eye. So funny to read this poem, because when we traveled over winter break and were in the Caribbean, a seashell reminded me of a toenail, and I half-composed a poem in my head about how the ocean was a giant, and when she clipped her toenails, they washed up on shore as seashells! I found this post through the wonder chat, then to Private eye page, and linked to this post. Like a full circle, somewhat. The coincidence is I had never heard of the Private Eye until last Friday when a colleague used it with our group of gifted students for an activity at Gifted By Nature Day. 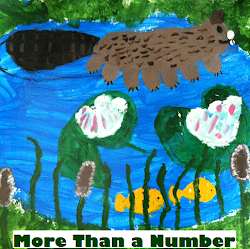 The results were great and now I want to order a set to have in my own classroom. Love your poem too. A nice catch from looking closely.